Decorating and furnishing an office involves a few different considerations than decorating a home. For starters, it’s a space where people come to work, so the right kind of lighting is important. Secondly, your interior design is highly attached to your identity as a company, and makes an impression on all who enter. Interior glass walls are becoming a common design element in modern offices. They create an open and honest atmosphere for coworkers and have more visual appeal. However, having multiple glass walls without any privacy solution is bound to become awkward at some point. To avoid the feeling of being in a fishbowl, shades offer immediate privacy when you need it. One-on-one meetings with clients and employees also benefit from having privacy. When you imagine walking over to pull all your blinds down and then twisting the tilt wand to get all the slats in the right position, it’s pretty time consuming, distracting, and can call unwanted attention. For this reason, we recommend honeycomb shades, which will provide full coverage without totally blocking out the light from the rest of the office. 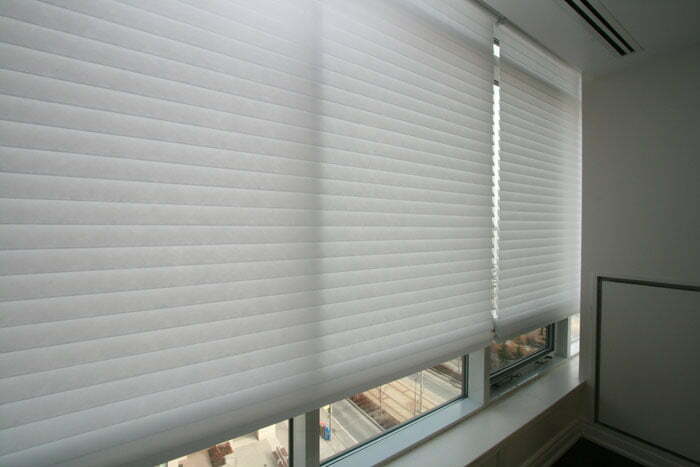 If you want blinds with slats that give you the “half-open, half-closed” option that provides some privacy while still looking available, we suggest investing in motorized blinds. Motorized blinds can be adjusted from your desk, or even from another room using a remote. 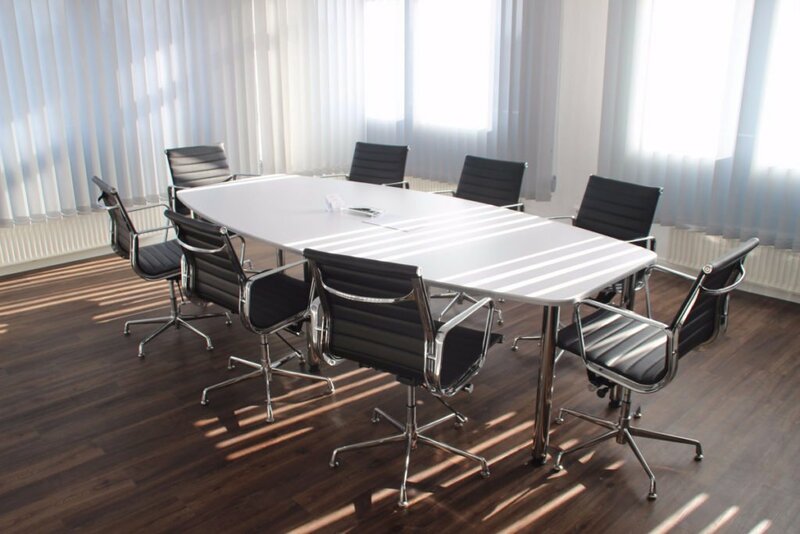 If your conference room features a wall of windows, it can make it difficult to achieve dim lighting needed for video or powerpoint presentations. Roller shades are a great choice for meeting rooms because they provide excellent coverage, both for privacy and also for blocking out sun. The meeting room shown above is using sheer panels, which looks open, airy, and attractive, and works well if you want lots of natural light. However, this isn’t the best solution if you do media presentations, and can cause glares in the eyes of those sitting facing the window. Roller shades can also be installed to drop from the ceiling, or in front of a wall to provide the perfect projector screen that takes up no space when not in use. The benefits of sunlight in the workspace has been discussed for a long time. It enhances mood, can boost your energy, and is overall more pleasant to work in. On the other hand, sometimes the angle of the sun in the morning or late afternoon can be agitating, especially if it happens to fall right over your computer monitor. The solution: versatile shades that take advantage of natural sunlight, but reduce harsh light and glares. 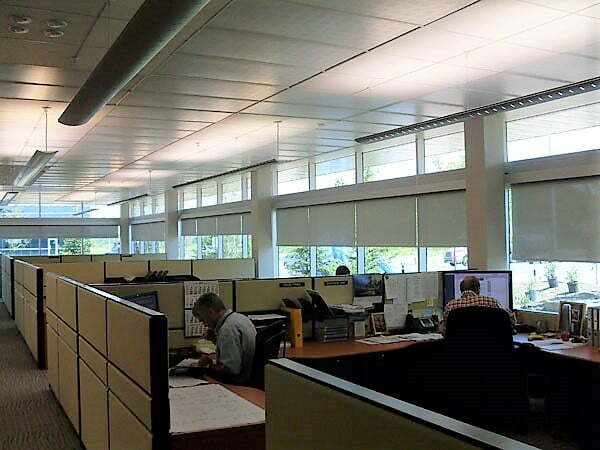 Roller shades and cellular shades are a top choice for today’s offices for this reason – they look sleek and modern, and they offer filtered sunlight when in use. You can customize the level of opacity on these shades, depending on how much sunlight you want to let in. If your thermostat is set to 72 yet everyone is still complaining its cold, chances are you have a draft. Even a room that is kept at a comfortable temperature can feel chilly if there’s a stream of cold air coming from somewhere. Windows are almost always the culprit of drafts, but you can beef up their insulation using your window treatments. Cellular shades by their very design provide the most insulation, but you can double up with curtains during the cold months. The layering effect of horizontally closing cellular shades and vertically closing drapes is the best way of dealing with drafts. Considering how often your window treatments are used, and the many ways they can have positive contributions to your work environment, they’re a smart, long term investment. If you’re in Ontario and interested in a quote or have any question on our custom window treatment options, contact us for more information.